[float=left] [/float] They are evil, all they have been doing in Nigeria is fraud, looting, stealing and fermenting trouble. This is a clear prove of what Jonathan and his men are doing to Nigeria. 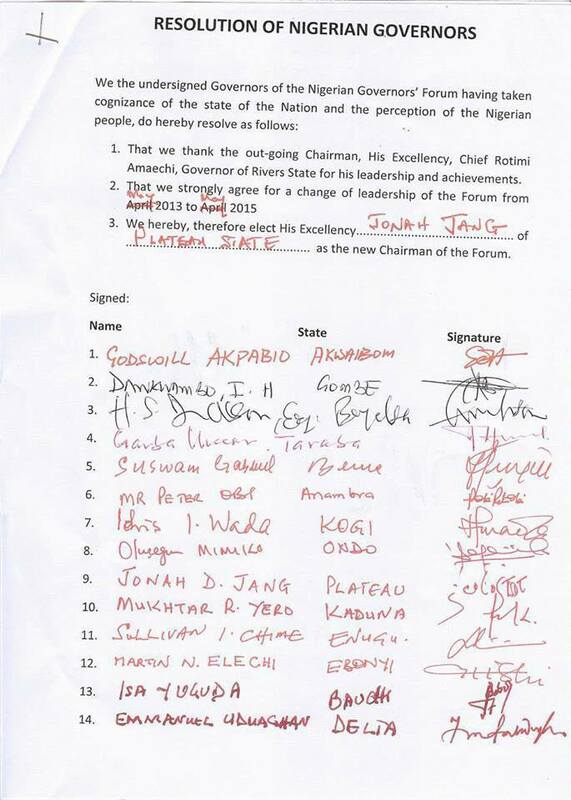 This is a document forged by Jonathans stooge governors to cause confusion and remove Gov. Amaechi after he was dully and transparently elected yesterday as the Chairman of NGF for the second time. Prove that this document is fake and arranged. 1. All the governors have the same handwriting. Please look closely to the writing on the paper protectedly written and signed by 18 governors and see clearly that the letters are same except the black biro that was used to write two of the names and that the signatures was signed by the same person. 2. The alteration in the date of the document as seen on the document. 3 The name Jonah Jang written on the paper is the same handwriting with other names and signatures on the paper indicating that they were written and signed by same person. 4. We are in May and the election was conducted yesterday, but the documents red April and was mutilated with a red biro. Can you remove the mask in your face and the sentiment whether religious, tribal or ethnic and see clearly that this PDP government is a fraudulent government. I am just speechless. PDP has finished Nigeria. What a pity. This nation has been in the hands of criminals. Gov Peter Obi has always been a chameleon and Gov Akpabio has proven to Nigerians that he is an expert in election rigging as he confessed recently. President Jonathan has shown Nigerians that he has no respect to the office of the president that he occupies. Nigerians! WHAT MORE DO YOU WANT TO SEE AND HEAR?